Saving for retirement is a very smart financial decision to make. It may seem like a long way off to younger people, but it is very important to plan for your future. It becomes even clearer to people nearing the age of retirement just how important retirement accounts are. 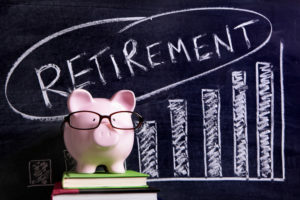 There are three popular types of retirement accounts to consider when thinking about where to put your money for your future: 401k, Traditional IRA and Roth IRAs. Let’s take a look at each type with a little more detail. Perhaps the most straightforward of the three is the 401k. The 401k is a retirement plan that allows eligible employees of a company to save for their retirement on a tax deferred basis. The contributions that the employees make towards their account are deducted from their salary pre-tax. Only employers can sponsor a 401k account, an individual can’t open one up on their own. A Traditional IRA account is for anyone with an earned income that is under the age of 70 ½ . With this kind of account your contributions are tax-deductible on your state and federal tax returns the year you make the contributions. You can only contribute $5,500 ($6,500 if you’re age 50 or older) per year with this kind of account. When you withdraw your money, it is taxed at normal rates. When you get to the age of 70 ½ , you must take at least a minimum mandatory withdrawal from your account whether you need the money or not. A Roth IRA is a retirement account that allows a person to save for retirement as long as they are under certain income brackets. If you are single and make under $133,000 per year, you can open a Roth IRA. For married couples, your earned income must be under $196,000 per year. Like the traditional IRA, you can only contribute $5,500 ($6,500 if you’re age 50 or older) per year. With Roth IRA accounts, both the earnings on the account and the withdrawals after age 59 ½ are tax-free. You don’t ever have to withdraw your money from a Roth IRA account if you don’t want to. If you have enough income from other places, you could let your Roth IRA grow tax-free for most of your life, making the account an ideal wealth transfer tool. There is a lot to consider when thinking about saving for retirement. Different accounts hold different pros and cons that depend on your individual needs. Always research and be knowledgeable about how you are going to save for your future.